The Bora Laskin Faculty of Law Library opened in September 2013. The law library is in the historic PACI building in Thunder Bay, sharing space with the law school and near classrooms and faculty offices. Our print collection contains around seven thousand volumes, with the capacity to expand to eighteen thousand volumes over the next fifteen years. 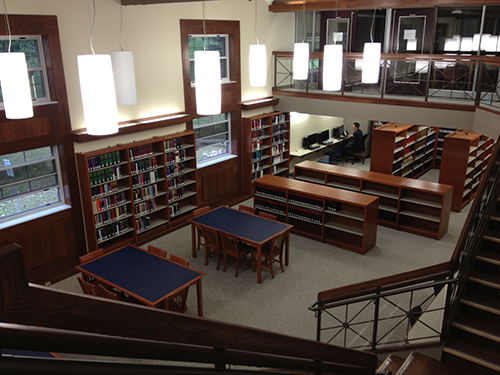 The Law Library has seating for 100, and a mezzanine level with 20 study carrels and four small group study spaces. Soft seating and computer desks are dispersed throughout the stacks on the main floor of the library. The collection is a mixture of digital and print. Both print and digital resources include a core of primary and secondary materials with a particular emphasis on Aboriginal Law, Natural Resources Law, and Northern practice materials suitable for rural and small town lawyering in accordance with the mission of the Faculty of Law. As we develop the collection, we endeavor where possible to expand access to interested groups outside of the law school. For example, we have access to HeinOnLine, a leading electronic journal database, and our user licence makes it available to researchers from other Lakehead University faculties.